What happens when art, beauty, and the big apple meet? A wonderland is born for all of New York’s makeup, hair, and styling gurus: on March 10-12, 2019, NYC was home to the 17th annual International Beauty Show. As a fashion and beauty lover myself, I was excited to see what this city was hiding for me this time. I’ve never been to anything like this before, and I didn’t know what to expect. From CBD-infused beauty, WTF hairstyles, and LED technology for wellness, the show was very much beyond any expectation I could’ve ever had. When I got in, I took a look across the many signs that filled the HUGE hall, and I read “Hair Section”. 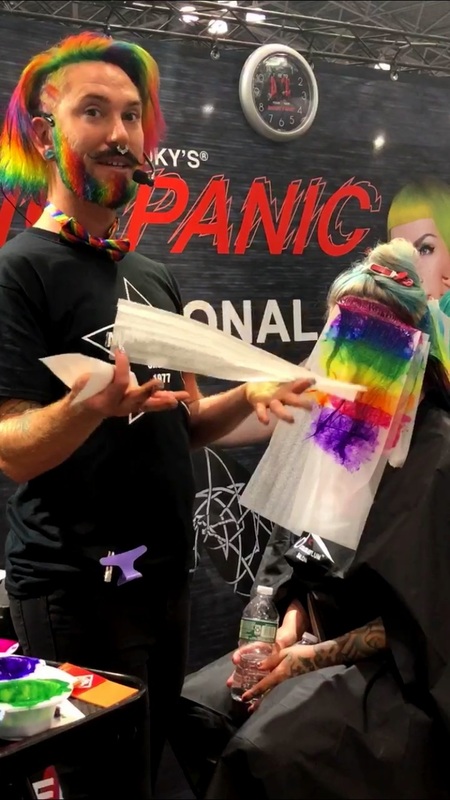 I went there first, and found myself walking around many live demos, giveaway shows, hair extensions, and product promotions… But, it was the rainbow-bright hair tutorial that directly grabbed my attention. The teacher had a rainbow beard, a rainbow hair, and a rainbow necklace, and he was showing how to do a (you’ve guessed it) rainbow hair tutorial! All of a sudden, models started walking around the hall, but they were looking gorgeously unusual: they were transformed into beautiful creatures, and were only wearing makeup on-the NYC way! Amazed, people directly started snapping pictures of the models, as they graciously posed for the many cameras pointed at them. I then strolled around the hall again, and I saw a beautifully-lit stage with people seated, as if waiting for a show to start. Curious to know, I sat down and waited for the performance too. It turned out to be both a fashion show and a live class workshop with renown New York hair-stylists. This is when I realized that the International Beauty Show was really a beauty haven, where NYC beauty lovers could get inspired by artists, learn new skills, and know all about the trendiest products and stylings. As I walked around for hours, I realized that there was something unique and new on every corner of the exhibition. I was too tired to continue, and there was still so much to see-but I wasn’t sad. The show went on for three days. That way, everyone could experience all of the its hidden surprises-and I was not going to miss out on that.